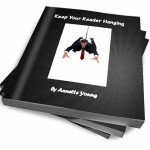 In December 2013, we gave you the opportunity to win a copy of Keep Your Reader Hanging by editor/author Annette Young. The lucky winner was Tracy Davidson, congratulations and a copy of the eBook is winging its way to her right now. Keep a look out for more free to enter competitions soon.